We have been following a tropical disturbance for several days now. 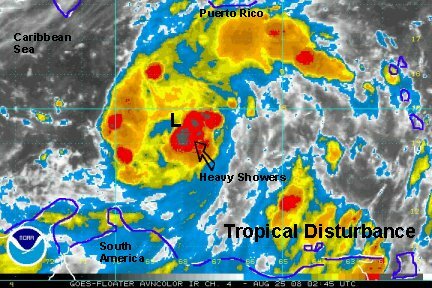 Over a period of five or six days this disturbance was on the verge of becoming the next tropical depression only to fade. The latest I.R. satellite imagery shows a strong tropical wave moving through the central Caribbean tonight. Deep convection is now building around a mid level center. Quickscat satellite shows that no surface low has formed yet. Seas are in the 6-7 foot range in the central Caribbean and winds have been measured to around 35 mph at a buoy near the disturbed weather. Forecast models take this feature mostly toward the western or northwestern Caribbean. This is possible since a mid level ridge over the eastern Gulf of Mexico should weaken. All interests in the western Caribbean and Gulf of Mexico should follow the progress of this tropical disturbance. Last edited by Caribbean Traveler on Sun Aug 31, 2008 2:08 pm, edited 4 times in total. Our tropical disturbance definitely looks like a depression, if not bordering on storm strength. This hurricane season, it seems as though the tropical disturbances has struggled to develop a surface center and this case is like that too. Last night a surface center did not exist, only a mid level one. Deep convection has now circled the center of the circulation. The Hurricane Hunters are expected to be on site early this afternoon, so we'll know exactly what we have. It may be classified straight to a storm if they find a surface low. The "tropical depression" is developing at an alarming rate. This no doubt is a tropical storm and should be named immediately. An eye like structure has formed and deep convection is building around the circulation center. The southern Dominican Republic will get squalls soon and the center of the low may pass over the southern peninsula of Haiti by noon tomorrow. 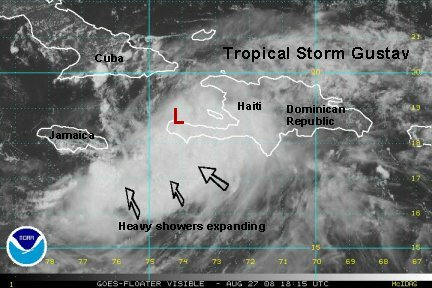 Interests in southwestern Dominican Republic, southern Haiti should prepare for increasingly rough weather later today. The forecast models do not have a handle on the situation yet, so they can't be trusted. NHC's forecast looks reasonable at this time. NHC should have named it earlier with that well formed circulation! Tropical storm Gustav rapidly developed from an open tropical wave to a tropical storm Sunday night into the first half of Monday. It appears that the rapid development has slowed with some dry air ingested into the northern part of the circulation. The center of the circulation had a closed structure while the Hurricane Hunters were investigating earlier in the afternoon. Since then, the center of the low appears to be somewhat open on the northern semicircle. This may lead to a short term break in the strengthening or even slight weakening. 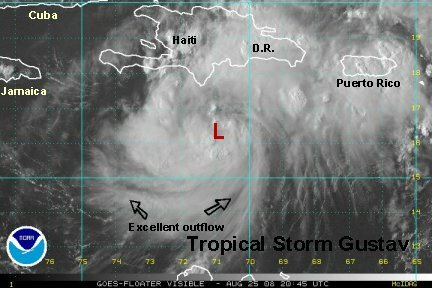 A large trough of low pressure is north of Hispaniola and is restricting outflow of Gustav to the north, unlike the excellent outflow observed to the south. We have to be very careful with this forecast. The models currently have quite a spread. The wind maximum is very tiny near the center and this can not only lead to rapid deepening and strengthening, but also a direction change with the change in strength. The models should start to get a better idea of where the low is soon, so better forecasts will be coming out. It appears to us that some of the models are still not even sure that a tropical storm is in the Caribbean. At this time, interests from Hispaniola through the northwest Caribbean into the Gulf of Mexico should follow the progress of Gustav. It is way too early know the strength or final impact on the U.S. (if anything substantial). Gustav has formed a solid eye wall and a Hurricane Hunter is now investigating. The previous advisory had Gustav at 70 mph. We expect that it will be upgraded to hurricane strength this morning, maybe with this next advisory. The eye wall is more pronounced on the southern semicircle. It appears that the northern part of the circulation suffered Monday from a number of factors.....1) Some dry air wrapped into the northern part of the circulation 2) Low level inflow was blocked by the high mountains of Hispaniola to the north. 3) A large trough of low pressure in the upper atmosphere to the north blocked outflow. We expect strengthening, possibly significant strengthening with all of these factors soon to be removed. 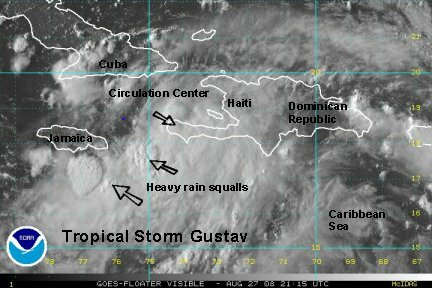 With the small size of Gustav it is possible for it to strengthen and weaken rapidly. At this point we are concerned about the strengthening phase. The models are taking Gustav farther to the west. It may brush Cuba or actually stay to the south as the models are just starting to get a feel for what is happening. We think it will head to the northwest Caribbean then after that, there are too many unknowns yet. A couple of reliable models diverge at that point one goes to the eastern Gulf of Mexico and the other to Belize. It all depends on the strength of the mid level ridge over the Gulf several days from now. It the ridge weakens watch out in the eastern Gulf. If the ridge stays strong, it could force Gustav into Belize or the Yucatan peninsula. So all points from Belize to the eastern Gulf are in play at this point. If anyone thinks that they know the landfall position now, don't believe them - they don't. It would be nothing more than blind luck to call a landfall at this time and would be irresponsible to do so. The price of oil is likely to go up on the threat of a system in the Gulf. We'll be watching the models closely. Gustav continued its strengthening phase this morning and now seems to have leveled off. The last pressure measured by the Hurricane Hunters was 982 mb. The downward spiral of pressure has slowed for the time being. It is centered just south of the southern peninsula of Haiti near the border of the Dominican Republic. It's interesting to note that the satellite appearance today doesn't seem as organized as yesterday. Monday, a well defined eye like structure was apparent. Today, one big mass of deep convection. We just can't see the internal structure under the clouds with normal satellite imagery. Thankfully today we have the Hurricane Hunters, as well as short wave and microwave satellite to "see" into the cloud mass where the circulation is still discernible. 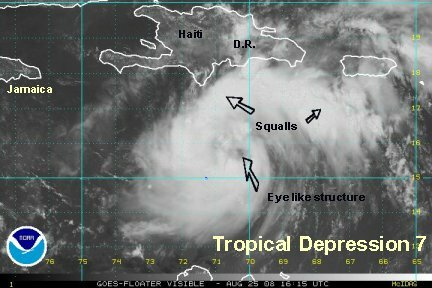 The short wave imagery shows that the eye wall will be crossing onto the peninsula of Haiti sometime early afternoon. This may weaken Gustav in the short term. 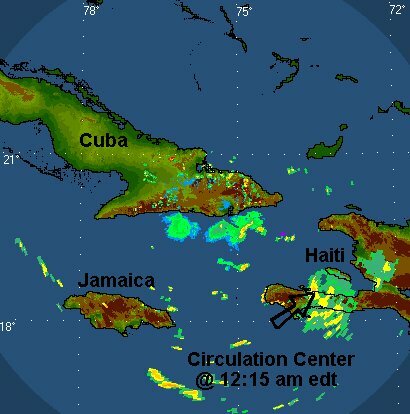 It is expected to move northwest then begin more of a westerly track between Cuba and Jamaica. The "spaghetti chart" forecast models available to the public, no doubt has concerned many people. One of the models in particular has Gustav heading straight toward New Orleans. In our previous update, we mentioned that the track couldn't be trusted yet. In fact NHC has adjusted their track southward and said that they will go even farther south if the model runs stabilize. Last night, our better performing models diverged in the northwest Caribbean. One to Belize, the other into the eastern Gulf of Mexico. The last runs now both have the Yucatan peninsula, into the Bay of Campeche. This gives us more confidence to go farther south with the forecast and believe this track too. The track will depend on the strength of the mid level high in the eastern Gulf over the next several days. In the meantime sit tight and follow Gustav closely. The northwest Caribbean is usually a zone where hurricanes like to strengthen, so Gustav still may strengthen significantly. The models are just coming in. It looks like the high is blocking the northwest motion. 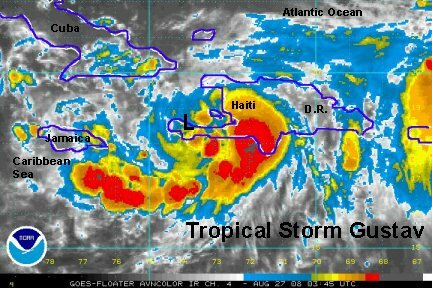 It may force Gustav farther west toward Jamaica. A full update will be posted in the early afternoon. 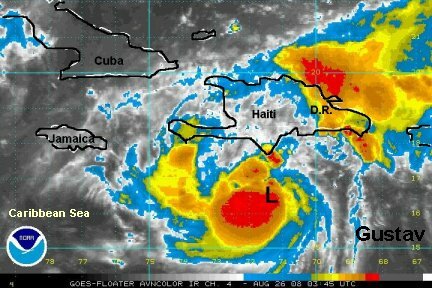 Recent satellite imagery shows that the eye on Gustav in now on the coast of southeast Haiti near the town of Jacmel. It has continued northwest, but a west or west-northwest motion should start soon. A temporary weakening should start soon as it is over land. Once Gustav emerges back over open water in the Caribbean Sea south of the Windward passage, strengthening should resume. The I.R. satellite picture shows an explosion of deep convection on the northeast side of the circulation. It looks like the strong southeasterly flow from the Caribbean is being forced orographically up the mountain slopes of Haiti. This is resulting in very heavy rain with no doubt flash flooding. Outflow aloft remains excellent on the east and south sides of Gustav. The upper trough still is restricting outflow on the north and west sides. As Gustav slides westward, it will encounter a more favorable upper wind pattern for development. At this time a recon is investigating Gustav. Very few reports are coming in. Usually a vortex message is released to the public just before the official NHC advisory comes out. Gustav is also in a zone of few buoy's, no radar and few surface observations. At this point we are counting on the Hurricane Hunters and satellite. The forecast models are still moving around. NHC appropriately said in an earlier statement that large errors are possible on days four and five of their forecast. We believe that the models are probably good to the northwest Caribbean. They take Gustav south of Cuba, similar to Fay. The track is clustered around the western tip of Cuba where most take the turn north into the Gulf of Mexico. The mid level high in the eastern Gulf and over Florida is forecast to weaken just enough in the critical time window of Thursday and Friday to pull Gustav into the Gulf. A mid latitude trough is forecast to drop toward the Southeast - that is why the high weakens. If the trough is just a bit weaker, then the high may be strong enough to steer Gustav farther west, like into the Yucatan or western Gulf. To sum up, it is too early to make the call on the recurvature toward the northern Gulf. After a few more model runs we should have a better idea soon concerning the chance of Gustav recurving into the Gulf. 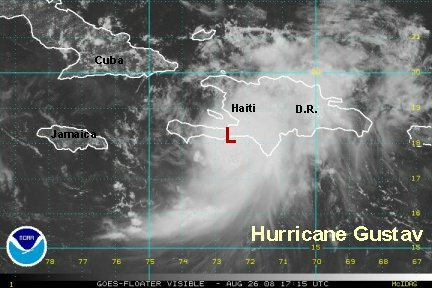 Gustav is moving more west-northwest now along the coast of the southern peninsula of Haiti. A more westerly course has begun. The last vortex from the Hurricane Hunters indicated a 992 mb pressure. That's up 10 mb from the from previous fix. They measured a max flight level wind of 51 knots, but we don't think that they were able to sample the whole circulation since Gustav was over land. Gustav also is showing a poor satellite presentation. In our opinion it is not a hurricane. Realistically a 60 mph tropical storm. It's hard to judge what NHC will do. They like to keep continuity with a system. The latest models seem to want to take Gustav near the Yucatan channel. They have shifted a bit west. Again, it's hard to call this far in the future, but the western Gulf may have the highest chance to see Gustav. NHC has kept Gustav as a minimal hurricane at 75 mph. The last Hurricane Hunter reported a poor radar representation of the eye and did not send back a vortex. This most likely due to the fact that the center is still over Haiti. 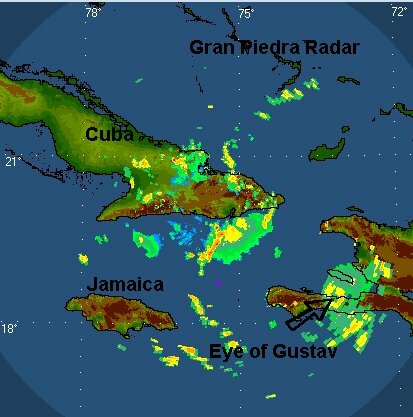 The center of Gustav is finally within radar range and the center can now be seen over the southern peninsula. Deep convection still exists over the Caribbean Sea and there is no reason to not think Gustav will make a strong comeback as it moves between Jamaica and Cuba. Weather will start going downhill in Jamaica tomorrow as it passes to the north of Jamaica Wednesday and Thursday. There's nothing to add about the models on this update. We will evaluate the new run and post our assessment on the next update at around 2 am edt. NHC officially downgraded Gustav to a 70 mph tropical storm at the 11 pm edt advisory. Discussing the matter with our colleagues, suggested what we mentioned earlier, that Gustav has been a tropical storm since Tuesday afternoon. NHC tends to go with a continuity factor. Our guess is that top sustained winds are probably closer to 55 mph. In a tropical cyclone gusts can be 15-20% higher than the sustained winds. 55 mph may actually be generous. 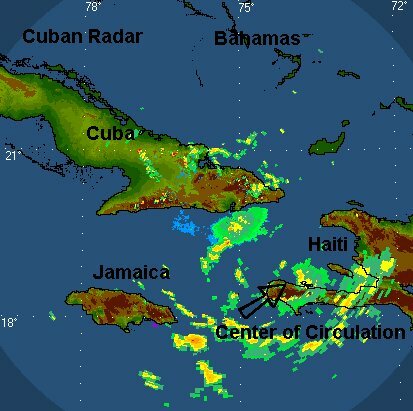 Heavy rain continues to pound the southeast portion of Haiti and southwestern Dominican Republic. The up slope factor of the high mountains is not doubt still causing flash flooding. The Weather Channel showed pictures of the serious flooding occurring in Port-au-Prince. The Hurricane Hunters are now checking out Gustav. So far, nothing very that is impressive. A detailed vortex just came in. The maximum outbound flight level wind was 39 knots and the surface wind was estimated at 45 knots. NHC just adjusted down to 60 mph. That is still generous! We still expect that Gustav will strengthen and this weakening should be temporary. The "spaghetti models" are probably good to the Yucatan. Some of the more trusted models are still all over the place. with this being the case, there is still a large window in the day 4 and beyond range...when it is near the Yucatan Channel. It's best to sit tight and wait for the models to be more consistent rather than making a bad call and having to retract it. 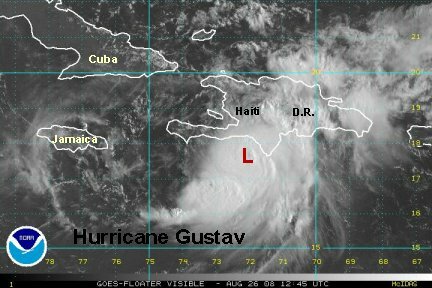 Gustav has not changed much, but is ready to move into the Caribbean Sea. 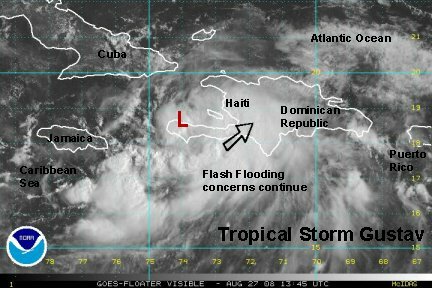 It is still over the tip of southwest Haiti. The Hurricane Hunters have shown almost no change in pressure with Gustav for over 12 hours now. NHC has kept the strength at 60 mph. They acknowledged that the recon did not find these winds but will keep it at this level because they think it will strengthen soon! The recon has found nothing more than 40-45 knot flight level winds over the last six hours. Gustav's top sustained winds must be near 40-45 mph with higher gusts. No way 60 mph is close. We do agree though that it will begin strengthening once it gets into the Caribbean Sea. NHC has day 5 on there track aimed now at New Orleans. They said don't read much into this because errors are very large at this point. The media is going to run with it and the panic will begin now. The forecast models still have not changed much, taking Gustav south of Cuba and into the Gulf of Mexico by the weekend. This part of the forecast is probably good. We are still concerned about the later part of the forecast - as most people are. The upper trough that drops into the Southeast late this week, weakens the mid level high guiding Gustav. Some models weaken it enough to take the tropical cyclone toward the northern Gulf, others keep the high strong enough to send it toward the western Gulf. And, there's the combo....one takes it north toward New Orleans, stalls it a few hundred miles south, then takes it west. 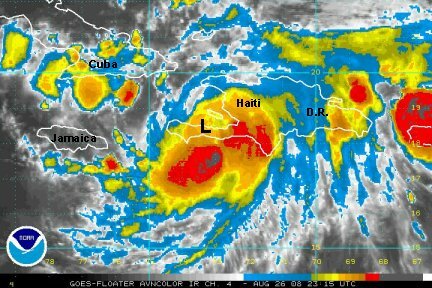 It is disconcerting to us still that Gustav is still over Haiti almost stopped. Regardless what the models think, observation and reality are more important. In this age of computer models, most people want to look at the computer forecast before the observations. That should be the last thing done. It is most important to check all of the current conditions to see if the models are any good at all. Gustav is still a weak system. The last recon measured a pressure of 1000 mb on their vortex message. Top surface wind estimate was 45 knots or about 50 mph. 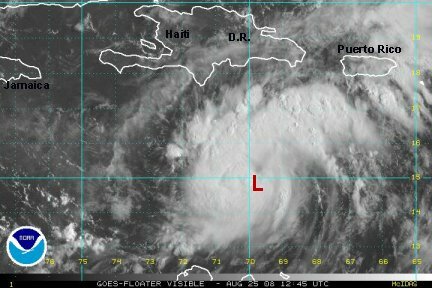 Gustav should start to regain strength soon as the center of circulation is moving over water again. We expect strengthening to commence soon. There has been a lot of media attention to the track heading to New Orleans. Keep in mind that day 5 of a forecast usually has high errors. We aren't saying that the track isn't right, we're just saying be careful with its interpretation. In fact one of the models that has this track, stalls it south of New Orleans in the Gulf then takes it to the western Gulf after day 5. 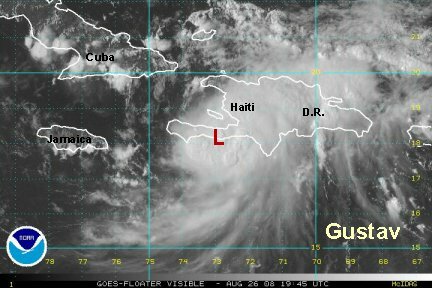 Gustav has certainly taken its time moving away from Haiti. The center of circulation is on the western edge of southern peninsula. With Gustav moving into the Caribbean and pulling away from the mountainous terrain, it is now heading into a more favorable environment for development. 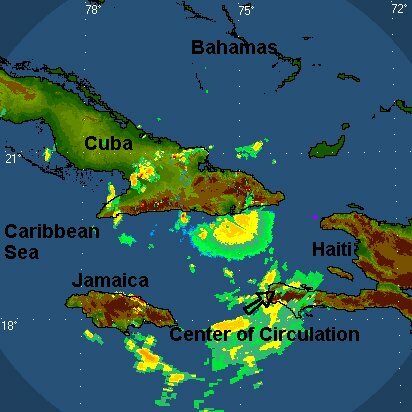 Deep convection is on the comeback especially south of Jamaica and over to Haiti. The Hurricane Hunters didn't find much wind as we mentioned earlier and finally NHC has taken the winds down to 50 mph. Pressure was last measured at 999 mb, so there hasn't been much of a change for 24 hours now. The forecast models are starting to come together a bit more. They are convinced that a weakness in the mid level high over the eastern Gulf will develop late this week into the weekend. This will allow for a turn into the central Gulf of Mexico. NHC has said that their days 3,4,5 are not high confidence forecasts. The issue with the forecasts appear to be with the rebuilding of the high after it gets into the Gulf of Mexico. It may stop Gustav before reaching the northern Gulf. Some models slow Gustav in the central Gulf then take it farther west. The strength of Gustav will be determined by the wind shear profile and if it gets toward the northern Gulf any dry air that may get ingested into the circulation. Water temperatures would only have a very minimal effect on Gustav and not figured into our forecast.